SAN FRANCISCO, California, June 22, 2010 (ENS) – An Indian tribe, an indigenous rights support group and a mining watchdog group have failed in their joint court bid to block the expansion of a gold mine in northeastern Nevada. A three-judge panel in the U.S. Court of Appeals for the Ninth Circuit on Friday upheld a district court’s grant of summary judgment against the plaintiff Te-Moak Tribe of Western Shoshone of Nevada and its co-plaintiffs, the Western Shoshone Defense Project, and Great Basin Mine Watch. The court ruled in favor of the Department of the Interior, the Bureau of Land Management, and a mining company. The dispute centers on the intention of Barrick Gold, a Canadian company based in Toronto, to expand its Cortez Gold Mine located in Nevada’s Lander and Eureka counties. In November 2008, the plaintiffs challenged the U.S. Bureau of Land Management’s approval of the Cortez Hills mine expansion, claiming that the expansion violates the National Environmental Policy Act, the National Historic Preservation Act, and the Federal Land Policy and Management Act. The expansion threatens Mount Tenabo, an important sacred mountain for the Western Shoshone people, the appeals court recognized in its ruling. “The project area also contains many pinyon pine trees, a source of pine nuts that were once a key component of the Western Shoshone diet and remain a focal point of Western Shoshone culture and ceremony. Although mining has impeded the collection of pine nuts, remnant stands of pinyon pine continue to be used as traditional family gathering areas by contemporary Western Shoshone. Finally, because of the Tribes burial traditions, the ancestors of the Western Shoshone are likely buried throughout the project area,” the ruling acknowledges. But the court ruled that because the Bureau of Land Management attempted to contact the tribe by phone for a consultation on sacred uses of the land, and the tribe did not respond to the phone calls on several occasions, the BLM satisfied its obligation to consult. The appeals court upheld the district court’s dismissal of the plaintiffs’ National Historic Preservation Act and Federal Land Policy and Management Act claims, but reversed and remanded with instructions to grant the plaintiffs summary judgment with respect to one of their NEPA claims. Under the original plan of operations for the Cortez mine, the Bureau of Land Management permitted the company to disturb a total of 50 acres of land within the entire project area for all three phases of the project. In July 2003, the company proposed to amend the plan to permit Cortez to disturb 250 acres. The Bureau of Land Management approved the amendment to the plan in violation of NEPA, as its environmental analysis of the cumulative impacts of the plan was insufficient, the Ninth Circuit ruled. The plaintiffs deserve summary judgment on that claim and the BLM will have to conduct further proceedings, the Ninth Circuit panel ruled. The BLM did not fail to prevent unnecessary or undue degradation of federal lands, as the plaintiffs had alleged, and so, the judges ruled, the Federal Land Policy and Management Act claim does not succeed. 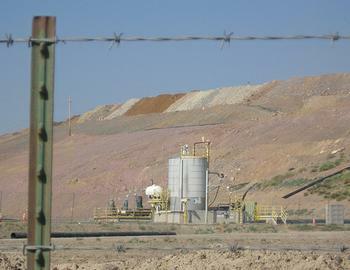 Click here for ENS previous coverage of the Cortez Gold Mine legal battle.